Here is the remote control unit that mounts in the cab. 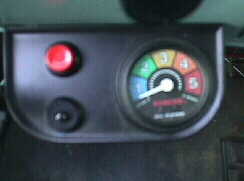 This unit has one control, and gauge, for all four shocks. Press a button to stiffen the shocks, press another to soften. There are units that control the front and rear independently, a better set up for most of us. Especially if you tow a trailer often, or use a snowplow. Here you can see the airline going to the shock. Two allen head screws hold the fitting, in the same place the knob was. Converting to remote control was easy. The airline in this picture, is cover with plastic wire loom, for added protection. Standard RS 9000 shocks require you to crawl under your truck, and turn a knob on each shock to change the setting. This task gets old real fast, and you don't experience the maximum benefit of these shocks. As an example, I go fishing often. One of the places I go is at the end of a rutted, potholed road. As I'm turning off the pavement, I increase my setting from 2 up to 5. This takes about 3 seconds. There is a huge difference in ride. 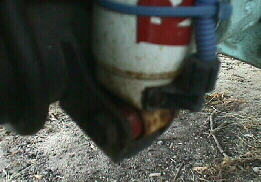 If I still had a knob on each shock, a dirt road about a 1/2 mile long, isn't worth crawling under to adjust each shock. Often it's raining when I go. There's no way I'd crawl under to each shock in the rain ! Again, get the remote control unit to suit your needs. You'll be glad you did. RS9000's aren't air shocks. They don't raise or lower your vehicle in any way. The remote control unit, supplies air to each shock, to change the valving. The same as it would be changed if you had the adjust the shocks by turning the knob on them. If you want air shocks, and often the lousy ride associated with them, then buy air shocks. If you want what I consider the best all around shock for 73-87 Chevy/GMC truck, and most trucks period, get the Rancho RS 9000's.